Pendant measures approximately 2-5/8" long (including bail) and 3/4" at widest point. Necklace measures approximately 16-7/8" long and is adjustable up to 23-5/8". Matching post dangle earrings measure approximately 1-5/8" and 1/2" at the widest point. 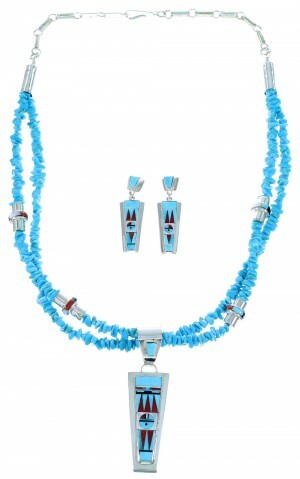 Take advantage of the great price on this amazing necklace set! 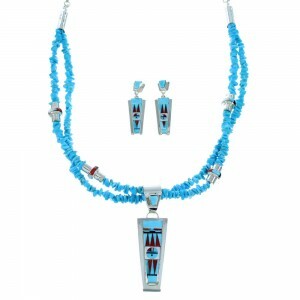 In this Native American jewelry set, the pendant is Zuni hand crafted by artist Raylan & Patty Edaakie, out of genuine sterling silver and a real multicolor inlay. The inlay consists of: Turquoise, Coral, Jet, and Mother of Pearl. The inlay is delicately set, while creating a gorgeous sun design. 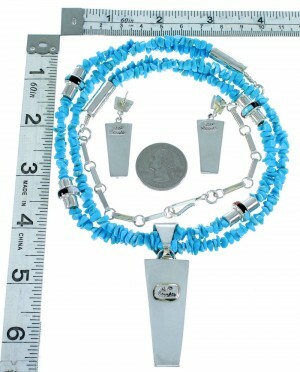 The necklace is hand strung out of genuine sterling silver, along with real Turquoise beads and real Multicolor inlay divider beads. The necklace is made up of TWO strands, that consist of: Turquoise free formed beads that have an average meaurement of 7-mm, along with FOUR 10-mm Multicolor inlay divider beads. 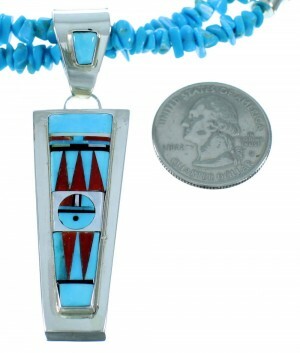 The Multicolor Inlay divider beads consist of: real Turquoise, Coral, Mother of Pearl, and Jet. 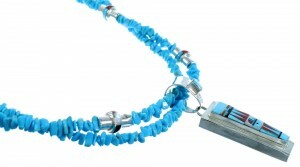 Each end of the necklace is completed with a silver barrel bead for a beautiful finish. The earrings perfectly match the pendant, for a remarkable finish to this set! In Native American beliefs, the sun is the provider of life, warmth, growth, and all that is good. The set is hallmarked by artist.